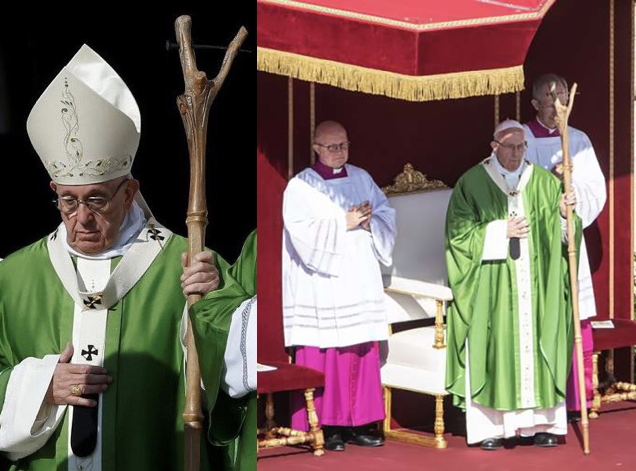 During the opening Mass of the Synod of Bishops on the Youth on October 3, Pope Francis carried during Mass a strange, forked, bamboo-like staff with bizarre connections to occultism, instead of the expected traditional Christian cross. The gesture has caused a lot of controversy online, with many commentators questioning why the Pope chose to open a major Church event by holding up not the crucifix of Our Lord Jesus Christ, but a strange, forked staff that has no visible connections with any Christian symbolism. Further investigation shows that the staff topped by a fork used by the Pope is related to witchcraft and Wicca, and in the United States, it is called a "stang".